I've been often in tears, after I left the hairdressers, because I wasn’t happy with the cut. Despite providing a picture every time, the haircut always turned out to be different as I have asked for. Once, a hairdresser cut my long hair into a very short cut and said, that I had to let my hair let grew again and then it will look like the the hairstyle in the picture. So I learned to cut my own hair. I love to experiment with my hair, and I have to say it has saved me loads of tears and money in the past. Today I will show you how to cut the fringe. 1. Start with dry hair. You do not want to cut your fringe while your hair is wet because the fringe will shrink when its dry and will look too short. 2. Using a comb, section off the hair you don't want to cut. Pin it back with hair clips. Only your sectioned fringe should be left loose. 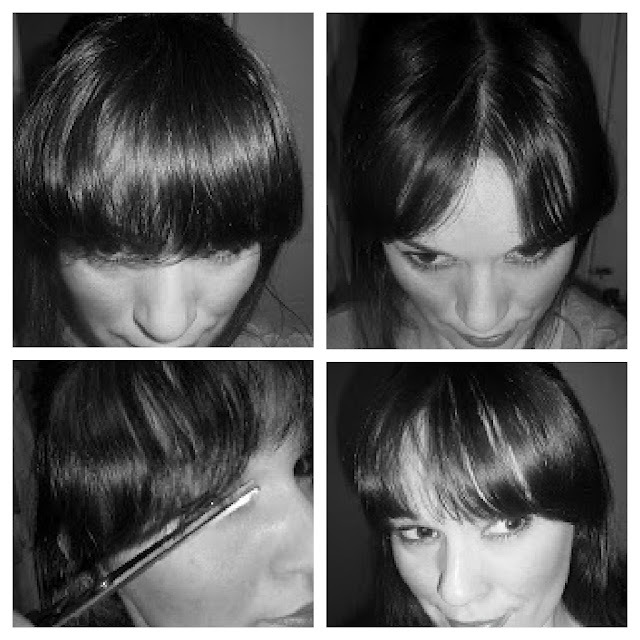 3 .Divide your fringe in half using a comb. 4. Take half and comb fringe. 5. Rest the comb on your brow bone. Don't cut your fringe any shorter than where the comb hits your face. 6. Cut the hair at a 45-degree angle. Just make sure to cut slowly, doing a bit at a time. Never cut the fringe straight across since it's impossible to keep a perfectly straight line and it also can look bit severe. 7. Repeat to the other half. what a great tutorial! i cut mine myself all the time just because it grows so fast and i don't have time to go to the stylists every time! WOW that was so useful.thanks !! Awesome! following your blog too thanks for your comment in my blog. Alltough i'm not quite sure if i would dare to do it myself, haha..
Oh man, I wish I was able to do my own hair. I DREAD going to get my hair cut because it seems EVERY time, they cut it shorter than I want no matter how much I emphasize how small I want off. So now, I've been left to just not get it cut at all. Unless I acquire some mad skills like you. Very cute!!! I always cut my own hair!! but im looking for a new look, so i guess i should go to a professional!! lol cute blog!